Do you struggle with falling asleep or staying asleep? So do an estimated 68 million Americans in the USA who have tried methods that do not work or have negative side effects. In this workshop you will learn a systematic and wholesome approach that draws from 25 centuries of the healing traditions of Yoga and Qigong, to get to the root of your troubles sleeping, and provide you with healthy tools to overcome insomnia, and significantly increase your overall well-being. 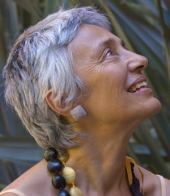 Amelia Barili, Ph.D. (Yoga Therapy and Philosophy, 1972, Kaivalyadhama Yoga Institute, India) is an internationally respected yoga teacher and a disciple of Grandmaster Yang Mei Jun, the 27th inheritor of the Taoist Medical Qigong system. She is a pioneer at integrating both wisdom traditions. She is also an award-winning faculty at UC Berkeley and the Osher Life Long Learning Institute, where she teaches youth and older adults a systematic embodied mind approach for personal and community transformation. A deposit of $100 is required with registration. Balance is due upon arrival. Deposits are non-refundable and are not transferable to another person. For cancellations received at least 2 weeks before the program starts, the deposit less a $50 fee will be credited to any other program within one year. No credit is available for cancellations less than two weeks prior to the program start date, for no-shows, or for leaving an event early. Housing changes incur a $20 change fee. Registration check-in for this program is from 4:00 pm to 6:30 pm. Dinner is served from 5:30-6:30 pm on Friday and 5:00-6:00 pm on other days. If you will be arriving late, please ask us to save a dinner for you. Orientation begins at 7:00 pm. The program will end at 1:00 pm on the final scheduled day.